We’re big fans of delicious food, and our best guess is that you are too. Yet, for some reason, many people are still settling for mediocre meals when they venture outdoors. There’s nothing more disappointing after a long day on the trail than having to dig into a big bowl of blandness. It makes our stomachs sad just thinking about it. 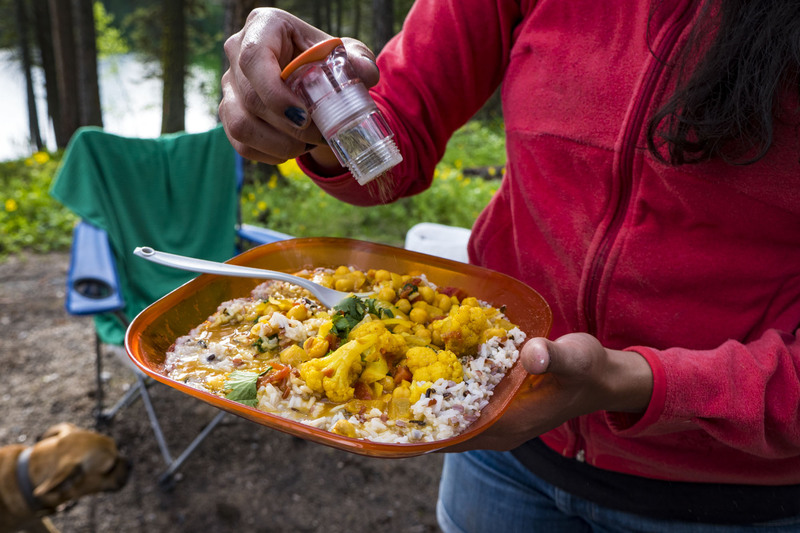 We don't want you to suffer through a tasteless backcountry dinner ever again, so we’ve assembled our favorite spices and spice receptacles to make it easy to spice up your campsite meals, wherever you are. There are plenty of ways to season your food, and there are plenty of tools for storing your seasonings. Before deciding on what spices to bring on your camping adventure, you need a spice receptacle that best fits your needs. All our spice containers are waterproof and sealed so your spices stay dry and your backpack stays unseasoned. Six-chamber Spice Missile weighs in at 2.1oz and screws together to keep your spices fresh and dry. Rotating screens let you season with ease and make refilling a breeze. Three double-sided spice containers hold six spices in the Spice Rack, all strapped together with a loopable bandolier for backpack organization. Includes large and small removable spice screens so you can add a dash without dousing your dinner. If you’re an only-the-essentials cook, we offer three salt and pepper shakers for your salt and pepper needs: minimalist Ultralight Shaker, the slightly larger modular Booster Shaker, and the standard two-compartment Salt + Pepper Shaker - all easily fillable and tightly sealed. Grind pepper wherever you are with the ultracompact and rugged Peppermill. Makes your meals fresher than fresh. Once you've got your spice receptacle nailed down, you have to decide what to put in it. Salt and pepper aside (we're sure you've got that on lock), we like to bring spices that are versatile enough to be used in all sorts of camp meals but still pack a punch. Here are our six favorite spices and seasonings for camp cooking - perfect to fill the six chambers of a Spice Rocket or Spice Missile. Cayenne Pepper - used by many different cultures around the world, add some capsaicin to your dinner with cayenne. Bring some heat to dehydrated camp meals or sprinkle onto anything you'd usually smother in hot sauce. Cinnamon - not just for desserts. Add some warmth to drinks, stews, chicken, lamb, or curries for aromatic flavor without getting spicy. Chili Powder - a blend of ground ancho chiles, paprika, garlic powder, oregano, and other spices, chili powder gives any meal a kick. Best on meats and beans, use chili powder on tacos, chili, or even a burger. Chili powder is a perfect solo spice, but goes well with extra cumin, garlic powder, or oregano to satisfy those taste buds. Oregano - technically a dried herb, oregano adds a unique lemony flavor with a single shake. A must for tomato sauce, beans, or poultry for a little Mediterranean punch. Garlic Powder - freshly minced garlic probably isn't on your ingredient list for a backcountry meal - substitute garlic powder for the same essential taste. Garlic powder is a great addition to meat rubs, soups, grilled veggies, sauces, and pretty much everything else. Curry Powder - a blend of Indian spices (coriander, cumin, tumeric, and more), curry powder adds rich flavor to veggies, beans, and meats. Bring this one seasoning so you don't have to waste space on four different spices to achieve the same bold flavor. Seasoning your food is always up to personal preference, and we recommend experimenting to find the spice combination that's right for you and your dinner. Launch those meals into the realm of deliciousness.